How many calories did I just burn during that workout? I wonder how many points are in that scone at Starbucks? I heard kale is good for you; I’m going to go buy some. I can’t BELIEVE I just ate that slice of pizza for lunch; I’ll just have to start my healthy eating plan tomorrow. I’m going on vacation next week and I can’t believe I haven’t lost that 10 pounds yet. I’m failing at this diet thing once again. I am going feel gross in that bathing suit for sure. It didn’t happen overnight, it wasn’t easy but it happened. It is such a relief. It is so amazing. I had it in me the entire time and so do you. What does it take you ask? What worked for me and what works for my clients that are losing weight for good are these basic tenets. 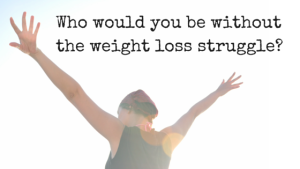 They are the sure fired way that you can step out of the diet struggle in your life and lean into spending that mental energy in a new way. See if you can quiet that Diet conversation in your head! Try One of these steps into freedom, practice it and THEN try another. Let your body lead: Eat when you’re hungry, stop when you’re full. Trust your cravings: Yes, I said trust them. If your body is craving some red meat, plan on a steak night for goodness sake. And don’t ignore your body when it craves some green stuff or fruit either!! Stop overeating: Get to the bottom of some of your classical emotional eating moments (patterns). Give them some attention. Look at what you are really craving. Is it a little more joy, some rest, some attention? Take care of yourself in a new way without food. Stop exercising to compensate for overeating: Much easier to do we stop overeating, yes? You might find that you move more when the purpose for the moving is just that, moving. Do what you love!! Be mindful about what you put into your mouth, in a kind & compassionate way. 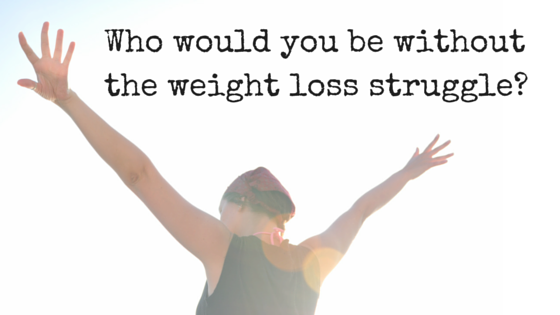 Shift the shaming conversation to noticing what you are choosing to eat. There are no BAD foods, just pay attention what gives you energy, tastes good and satisfies you for more than an hour. Wh0 would I be without the weight struggle? Like a heavy winter coat in July, decide to take it off, lay it down and live without that burden for good. Try a mini Power Session to see why you’ve stopped trusting those quiet signals that your body is sharing with you. Hop on a free call with me, you’ll be glad you did.